In September, we're posting one cartoon per day as part of Vegan MoFo. Our theme, *Vegan Faux Show*, showcases various methods for creating vegan versions of classic foods like bacon, eggs, and cheese. This Vegan MoFo is full of firsts for us: our first tofu cartoon and now our first tempeh cartoon. 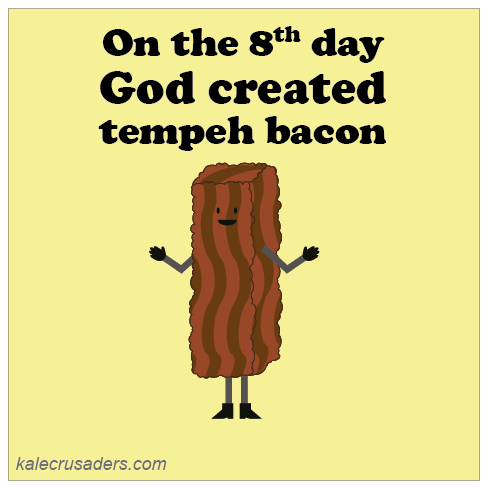 Tempeh bacon is classic vegan diner fare and, armed with this Tempeh Bacon recipe by Jennifer Cohen Katz at Eat Well Meals, get ready for some major BLT action!